Simple and dependable, the JIFFY-Pro Handheld Sharpener is quick, safe, and easy to use in the field, back at camp, or in your home. The knife sharpening slots incorporate crossed carbide blades used to set the edge on your extremely dull or damaged blade and crossed ceramic rods used for honing the final edge to razor sharpness. 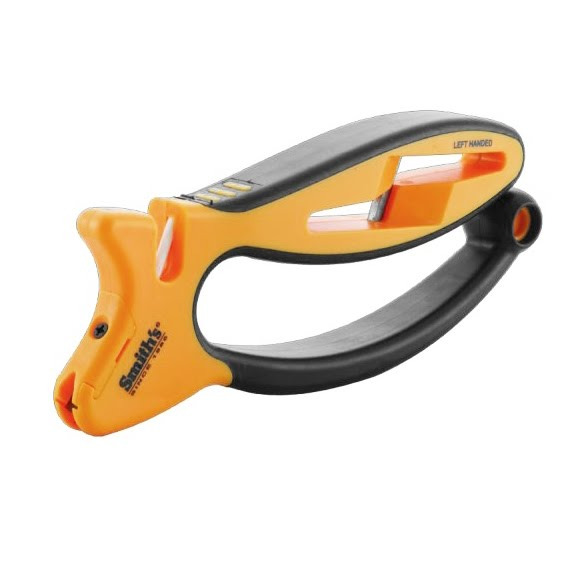 Simple and dependable, the JIFFY-Pro Handheld Sharpener is quick, safe, and easy to use in the field, back at camp, or in your home. The knife sharpening slots incorporate crossed carbide blades used to set the edge on your extremely dull or damaged blade and crossed ceramic rods used for honing the final edge to razor sharpness. These fixed abrasive components create a preset sharpening angle that guarantees results every time no matter where you are sharpening your knife. The scissors sharpening slot in the handle of the JIFFY-Pro has been enlarged to accommodate game shears as well. It uses a patented, &apos;FLOATING&apos; carbide rod that adjusts to fit the precise bevel of the blades and has a soft grip rubber handle for a firm, comfortable grip in all conditions.